I have some amazing news to share with you (as well as a giveaway)! 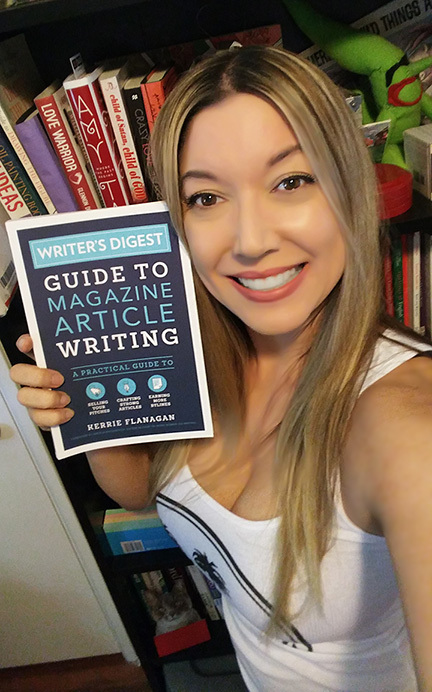 I had the pleasure of writing the foreword for Kerrie Flanagan’s book, the Writer’s Digest Guide to Magazine Article Writing—a phenomenal writer’s resource that publishes today. I’m so proud and honored to be a part of this project. I first met Kerrie back in 2009, when she sent a letter of introduction to WOW! Women On Writing that caught my attention. She talked about her passion for helping writers, her 100+ clips, and her experience starting the Northern Colorado Writers (NCW) organization. She wrote about an NCW conference, where she mingled with authors and agents and pitched article ideas for various departments. I wrote her back immediately, and asked her to write her first piece for WOW, which was How to Pitch to an Agent at a Writers’ Conference, an evergreen article that many writers return to time and time again. 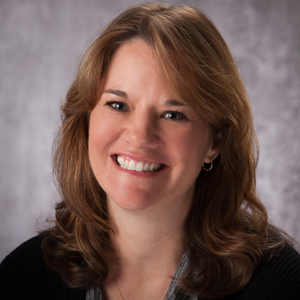 Over the years, she’s written articles for WOW on a variety of topics—everything from Feng Shui for Writers to How to Craft a Travel Article About Your Hometown. Kerrie’s strength is coming up with creative ideas that I never would have. Her vision inspires mine. Plus, she’s an expert writer, and her writing style is friendly and knowledgeable, as you’ll see in this book! I’ve read many books on the craft of freelance writing, and many, many articles; and this is THE BEST book on magazine article writing I’ve ever read. If you are a writer just starting out or have some clips, but want to land better assignments, this book is gold. As someone who’s worked on both sides of the desk, I can tell you that Kerrie’s advice will save you years of learning the hard way. 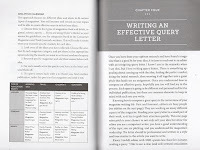 Kerrie’s chapter on querying will teach you how to pitch editors effectively and land assignments. It should be required reading for freelancers (IMHO)! She also shows you how to come up with ideas, study a magazine (in an ingenious way I haven’t heard of before) and walks you through each step, providing worksheets to help you track a publication’s needs. She chats with amazing writers, like Andrew McCarthy who shares a kernel that will change the way you think about beginning an article. The editor round-ups are priceless. Editors from publications, like The Costco Connection and Condé Nast Traveler, share their best tips. It feels like you’re sitting across from them having coffee. And that’s not all. Kerrie provides you with the tools to succeed as a freelancer, including practical tips on goal setting, productivity, and awakening your creative muse. There’s also a chapter on writing and selling personal essays that reads like a mini-book. The chapter on writing for online markets highlights the differences between print and online; and finally, there’s a fascinating chapter on using article writing to build a platform. If you are a fiction writer, you will learn how to pull topics from your novel to craft articles that will help you find readers. And that’s what we all ultimately want, right? To find readers. To build our tribe. To share our ideas with the world. Writing and submitting certainly takes nerve, and the possibilities are endless, but courage is not enough. It also takes know-how. That’s what this book can provide. And it’s all in one place! No wading through articles to find all the information you need. It’s nice to have all this fantastic advice in one easy-to-reference package. To celebrate today’s publication launch, we have a couple of copies to give away. 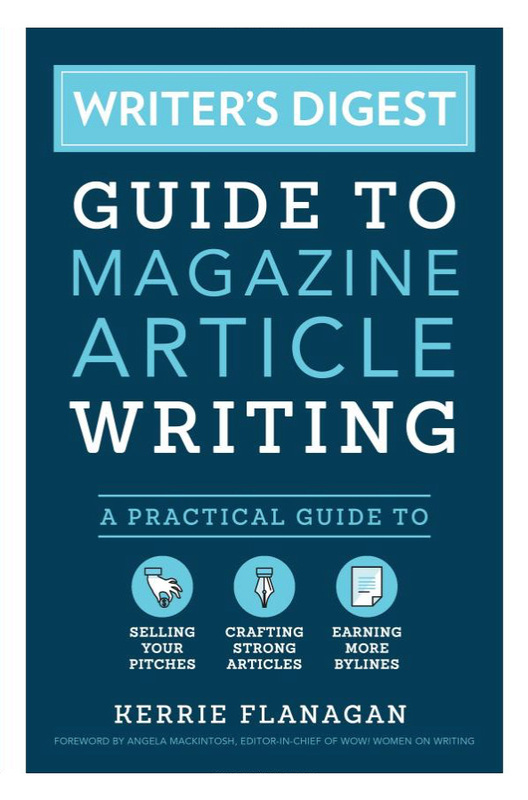 Enter the Rafflecopter form below for a chance to win a copy of Writer's Digest Guide to Magazine Article Writing: A Practical Guide to Selling Your Pitches, Crafting Strong Articles, & Earning More Bylines by Kerrie Flanagan. The giveaway closes Tuesday, July 31 at 12am. 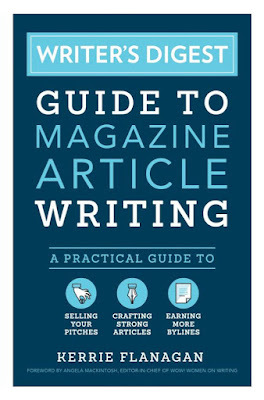 You can also pick up a copy the Writer's Digest Guide to Magazine Article Writing at the Writer’s Digest Shop, Amazon, Barnes & Noble, Walmart, IndieBound, and more! This is seriously a dream come true for me. It’s a thrill to have my name on the cover, right underneath my friend colleague, Kerrie Flanagan. To find out more about Kerrie, please visit KerrieFlanagan.com. You can also connect with her on Twitter @Kerrie_Flanagan, on Facebook @KerrieFlanaganWriter, and on Instagram @kerrie.flanagan. Thank you, and I totally appreciate your support! Follow the advice in Kerrie's book and get your words published. Angela--This is perfect timing, because I'm working on an essay--relatively new for me--and would desperately like to branch out of my rut and start submitting more and to different markets. You've done an AMAZING job telling writers of all walks of life why we need to purchase this book, now! I am tickled pink and not at all surprised they asked you to contribute to it. This sounds like a must-have resource and I can't wait to check it out and read your brilliant words of introduction! It's been a while since I tried to submit to magazines. Maybe it's time again. This book sounds great! This is just the book I'm looking for as I wade into the freelance waters! Perfect! This is exactly what I need, and I didn't even know it. I can always count on The Muffin and WOW to have my back. Just what I've been looking for!! I'm trying to concentrate on writing articles for magazines and could use all the tips and hints I can get. Thank you! This looks like a great read; looking forward to it. I have pieces I'd like to try to break into the magazine business with, but need info on the pitching and other editor interface needs. Looks like this book will be just what I need, thanks! The industry needs updated books on magazine writing as methods change, the way editors filter information changes, and writers need to adjust and learn and grow with those changes. Sounds like a great book and I'm definitely curious about this tip on researching magazines. Which, when breaking in, can be time-consuming, but is so worth it! Thank you all for your wonderful comments and congratulations. After working with Angela and WOW for so many years, it was an honor to have her write the forward. I am glad you are all excited about the book. It makes me smile knowing I have created something that will help people on their writing journey. Don't hesitate to reach out to me if you have any questions (all my contact info is in the lovely post by Angela). A most needed book. So many changes for those who write for "magazines." Besides writing short creative fiction pieces improves a writer's fiction work. Who knew? This sounds like the perfect help for creative nonfiction writers and essays for submission to magazines. Thanks for the chance to win a copy. I'm very excited to read this book as it promises to save me much time and head me in the right direction as I query. Thank you for the opportunity to win a copy. Will definitely read this, either as a win or one that I end up buying! Thanks, Angela and Kerrie. I've blown my professional-development budget on other books about freelance and article writing; now I'm kicking myself and wishing I had held out until this one came out! It's what I was looking for all along. I'll start saving up and put it at the top of my "next-time" list. Thanks for the opportunity to win this writers guide. Maybe this would me a restart on writing again. I've been wanting to pick up a copy of this book. Angela, powerful copywriting! I signed in for the raffle, but if I don't win, I'll buy the book. It sounds perfect for getting into magazine writing. Thanks, Angela, for sharing this information. Many of my writer friends are turning to magazines again because there are a variety of opportunities! I need to get a copy of the book! Congratulations on all of your success -- can't wait to read the book! Thank you all for entering the giveaway, and for your thoughtful comments! Y'all are so sweet to congratulate me, but Kerrie is definitely the star here. The foreword was easy to write since Kerrie wrote such an amazing book! I can't say enough good things about her book. It's so needed, and the best book on magazine writing I've read. Her guide will serve as a staple in my writing library for years to come. Writer's Digest Shop (they have an ebook version there as well), Amazon, Barnes & Noble, IndieBound (support your local indie bookstore! ), and more. Walmart and Target are carrying it as well. Thank you so much! I'm so excited and can't wait to read the book.